For the discerning small car buyer who wants that little extra bang for their buck, Kia has come to the party with the Limited Edition Cerato eXtra. Slipping in between the Si and SLi trims in both sedan and 5-door hatch body styles, the strictly limited eXtra benefits from the extensive Si standard range of equipment _ including Bluetooth, tilt and telescopic steering adjustment, cruise control, remote audio controls, folding exterior mirrors and Kia’s lauded local ride and handling _ then adds 17-inch alloys with full-size alloy spare (previously 15-inch steel), front fog lamps, rear parking sensors, leather wrapped steering wheel and chrome-tipped exhausts. Available in five exterior colours _ Clear White, Ebony Black, Bright Silver, Titanium Silver and Racing Red (hatch only) _ the new eXtra adds a touch of additional premium style and sparkle at a value cost. The Cerato eXtra 6-speed manual is priced at $21,490 while the 6-speed automatic is $23,490. That represents a premium of just $1250 over the comparative Si model hatch and $1500 for the sedan. The Cerato eXtra limited edition is on sale at dealerships now. (SEOUL) April 19, 2011 – Kia Motors and its Chinese joint venture, Dongfeng Yueda Kia, unveiled the K2 B-segment sedan today at the 2011 Shanghai Motor Show. Based on the platform of the all-new Rio, which made its world premiere at this year’s Geneva Motor Show in March, the new K2 was designed and engineered specifically for the Chinese market and will enter production at Dongfeng Yueda Kia’s manufacturing facility in Jiangsu province starting this June. A 5-door hatchback of version of the K2 will commence production in August of this year. K2 will be positioned as a premium small car with advanced styling and upgraded levels of quality and performance, and is expected to be a highly competitive offering in a segment that accounts for 16% of all new car sales in China. K2 represents the next phase in Kia’s strategy to better satisfy customers in various regions of the world by developing and marketing products that reflect local tastes and needs. Following the introduction of the cee’d family of C-segment vehicles and Venga B-segment MPV, which were designed and engineered specifically for European customers, the new K2 is a clear sign of Kia’s commitment to become a leading automotive brand in China. While sharing the same technical underpinnings as the all-new Rio, the K2 has been completely redesigned for the Chinese market, drawing on styling cues from the popular K5 sedan (known as ‘all-new Optima’ in many markets), including sophisticated lines that create a dynamic, bold and sophisticated exterior appearance. The front view features Kia’s signature “tiger nose” radiator grille and exudes a high-tech and bold image thanks to innovative fog lamp design, large air intake and dynamic swept back headlamps. A side character line, side air vent and trunk edge line add to the sporty image of the K2 while the rear view features a two-tone bumper and modern combination lamps. The driver-focused futuristic interior conveys a spacious and comfortable feeling, and drivers will enjoy a 3-cylinder supervision instrument cluster, cloth lined door panels, leather steering wheel and TGS knob, and button engine start and smart key. Measuring 4370 mm (overall length) by 1700 mm (overall width) by 1460 mm (overall height), the K2 is longer, wider and lower than the previous generation Rio and boasts the longest wheelbase (2570 mm) in its class. The expanded dimensions allow K2 to claim best-in-class interior space and ample luggage capacity of 500 litres (VDA). Space utilization is further enhanced thanks to the 60:40 split rear seat folding. Continually praised for its head-turning exterior design, fun-to-drive performance, and long list of standard safety features, the all-new 2011 Kia Optima has been included as part of “Ward’s 10 Best Interiors” list. Kia’s midsize sedan was picked for being able to connect with midsize buyers in the US with its upscale and aesthetically pleasing interior packaging, features and overall value. In Australia, the Optima offers an unbeatable list of standard features that sets it apart from the mid-size sedan market. This prestigious accolade follows a slew of awards, including earning an overall five-star crash safety rating from the National Highway Traffic Safety Administration (NHTSA), being named a Consumer Guide® Automotive “Best Buy,” a “Top Safety Pick” by the Insurance Institute for Highway Safety (IIHS), an Edmunds’ InsideLine.com “Editors’ Most Wanted” and “Best New Model” by Kiplinger’s Personal Finance. It was a historic weekend for Kia Motors’ second-year motorsports program as Michael Galati and Nic Jönsson co-drove the No. 10 Infinity Audio Kia Forte Koup to the company’s first-ever racing victory in the Street Tuner (ST) class of the GRAND-AM Continental Tire Sports Car Challenge (CTSCC) race in Birmingham, Alabama. Kia’s perpetual favourite, the Grand Carnival people mover, has continued its winning streak with recognition as the winner of the carsales.com.au People’s Choice Award for People Movers. 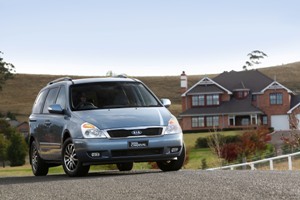 One in three people movers sold in Australia during November was a Kia Grand Carnival. The carsales.com.au People’s Choice Awards are considered an important measure of the strength of brands and models in the new car marketplace. Voting is based on genuine customer new car purchase enquiries placed via carsales’ network of sites, including carsales.com.au, CarPoint.com.au, Redbook.com.au, discountnewcars.com.au and prestigenewcars.com.au. The votes were tallied over a 12-month period from November 1, 2009 to October 31, 2010 with each vote equalling one genuine enquiry on a new car via one of the above mentioned carsales network websites. Research shows a very high correlation between genuine enquiry and new car purchases. This makes the People’s Choice Awards a valuable indicator of the fortunes of brands and models within the private new car market. carsales.com.au CEO Greg Roebuck says the 2010 carsales.com.au People’s Choice Awards were announced amidst a strongly recovering new car marketplace. “After a challenging period for new car brands, 2010 has seen us back on track to top the million new car sales mark. The 2010 PCA winners have benefited from having great product in the market at the right time,” Roebuck said. Kia’s exciting Sportage SUV has kicked an early goal in the awards season with a win in the SUV under $40,000 category at the prestigious Drive awards. The experienced panel of judges from the respected Drive and Drive.com media group put the all-new Sportage SLi diesel automatic at the top of one of the most crowded and competitive segments in the Australian motoring landscape. Kia Motors Australia CEO, Mr MK Kim, said he was both delighted and humbled by the decision to give the award to the Sportage. “We have always believed that the Sportage is an exceptional car, but to have this independent recognition from such a respected body is a wonderful verification of our belief,” Mr Kim said. Launched in August, the Sportage is a shining example of the marriage of form and function with head-turning styling from Kia’s global design team, led by head designer Peter Schreyer and penned at the company’s Los Angeles Design Studio by Massimo Frascella, and outstanding engineering. A key feature of the Sportage was the “localisation” of the ride and handling characteristics for the Australian market. The Sportage has specifically tuned spring and damper rates and now boasts tuned MDPS (motor driven power steering) which adds rake and reach adjustment. Streaming Bluetooth is also standard across the Sportage range. The 2.0-litre R series diesel is good for 135kW and 392Nm and coupled to the new 6-speed automatic, the performance is class leading. New safety features include ESC with a new Rollover Sensor, Hillstart Assist Control (to prevent roll-back when starting on an incline and roll-forward when reversing up a slope in reverse with the manual transmission) and Downhill Brake Control (to limit speed during a steep descent). VW’s World Car Of The Year, the all-new Polo, won the overall Drive Car Of The Year award with Sportage making the top four of the 14 category winners. Rising Korean car maker Kia has appointed a new dealership to serve Brisbane motorists and the timing couldn’t be better. Toowong Kia started operations recently at 601 Milton Road, on a well know site which it shares with Toowong Mitsubishi are the Toowong Roundabout. Serving buyers and service parts customers in the central business district and surrounding suburbs, Toowong Kia completes a network of Kia dealerships in the Brisbane Region. Dealer principal Craig Burgess says his family owned franchise has launched at an ideal time, with new Kia models just released or arriving soon in the showroom. ‘Kia as a brand has been growing steadily for the past 12 months. The kia sportive SUV is proving very popular with SUV buyers and so is the Cerato small car. The Cerato sedan has just been joined by a very attractive five-door hatchback variant, the medium size Sorrent SUV has just been awarded the maximum five-star crash protection rating, the 2 door Koup is expanding to two models and we are keenly looking forward to the early 2011 launch of the striking all-new Optima sedan. All these models represent the very latest in family car technology for performance, safety, economy and comfort. Kia’s diesel engines, in particular, provide an outstanding driving experience with their strong power, smoothness, low fuel consumption and minimal emissions’. But a tempting model choice should not be the only consideration when shopping for a new car at Brisbane Kia in Toowong, Mr Burgess advises. The promise of good service and support is also improtant for long-term ownership enjoyment. “It starts with ensuring the customer has a completely satisfactory buying experience and continues with a service department that is decocted to maintaining the car in optimum condition with minimal inconvenience or expense for the owner. We strive for that at Toowong Kia Brisabne. We’re a family company and deliver the kind of service people would expect with that. While the new Kia models continue to arrive, Brisbane Kia in Toowong is preparing to display them in a new stand alone showroom to be built early in the new year. It will be the first dealership in Australia to adopt Kia’s new corporate design style.